2012-12-19 – The international Green Key ecolabel is helping to position Brussels as a sustainable destination. It is awarded in Brussels by Inter-Environnement and supported by the Minister of the French-speaking Government of Brussels (Cocof) responsible for Tourism, in response to interest from the hotel sector and other types of tourist establishment based in the Brussels-Capital Region. This year, some new places to stay and, for the first time, event venues have received the label, including Tour&Taxis. 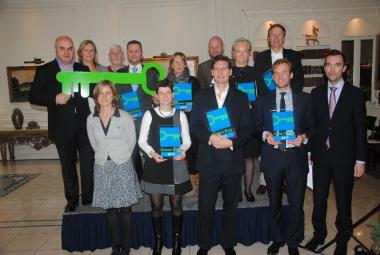 The third Green Key award ceremony was held at the Stanhope, Belgium’s first 5-star hotel (1991), which has also successfully completed its Green Key transition process. At present, Brussels has 19 places to stay (13 hotels, 4 bed & breakfast establishments and 2 youth hostels) and 3 event venues which carry the label. Over 2,000 establishments are Green Key accredited in 36 countries. To obtain the label, establishments have to meet different criteria relating to general environmental management, employee involvement, provision of environmental information to guests/customers (documentation, adapted signage, etc. ), water management, housekeeping and cleaning, energy management, waste management and prevention, food, nature-based activities, office administration, the interior environment and green spaces.